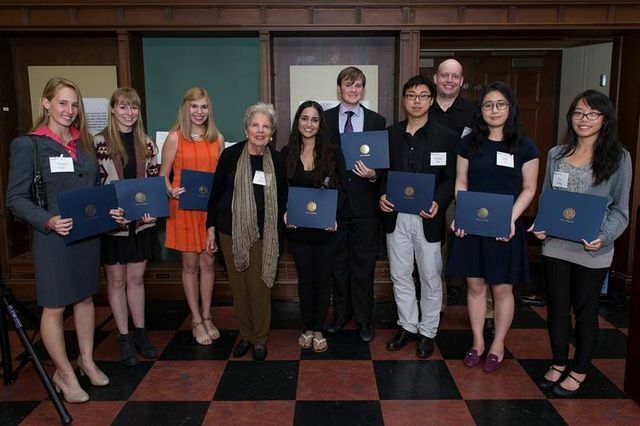 The winners of the UCLA 2015 Library Prizes for Undergraduate Research, with retired campus counsel Ruth Simon, center. As a Chula Vista fourth grader entranced by books and movies about pirates, Michael Stinson didn’t have to deliberate very long before selecting the subject for his first history project ever: the life of an English pirate. Faced with the same choice after 12 additional years of education, Stinson made the same decision, but this time the UCLA senior armed himself with all kinds of primary material from the 17th century, including poems and ballads celebrating pirate exploits, transcripts from their court trials, treaties designed to limit their reach and eyewitness accounts of their beheadings. 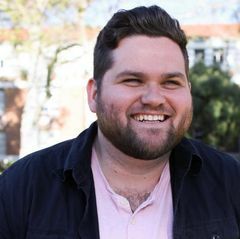 “I think my report’s a little better than when I was in fourth grade,” quipped the history major who expects to graduate from the UCLA College next month with high honors. The five-member committee who selected winners for UCLA’s 2015 Library Prize for Undergraduate Research apparently agreed. 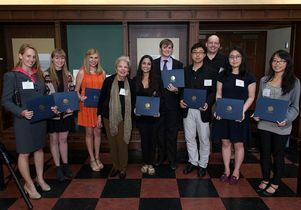 Stinson was one of 10 undergraduates honored May 13 for their use of resources from UCLA’s library system in the service of an original research project. Prizes ranged from $250 for research projects that resulted in reports that were fewer than 20 pages to $450 for projects that resulted in reports longer than 20 pages or took longer than one quarter to complete. Inspired by a gift from retired campus counsel Ruth Simon, the seventh annual event is one of the highlights of Undergraduate Research Week, a nationwide celebration marked by colleges and universities that provide students with research opportunities. 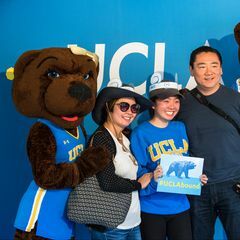 At UCLA, more than 700 undergraduates were expected to participate in 13 different events held across campus between Monday and today. As part of the ceremony in Powell Library, winners and their professors briefly explained their projects, which explored disciplines as diverse as Chinese linguistics and volcanic geology. Alison Mally, a pre-med sophomore, also researched a medical topic: the tension between academic freedom and establishing protections to protect consumers against scientific quackery like discredited research linking autism and childhood vaccination. People’s reaction to that paper, which the original has since retracted, has been blamed for a measles epidemic that plagued Southern California earlier this year. Another winner, senior geology major Brenda Pack, wasn’t able to make the event because she and her faculty sponsor, an associate professor in earth, planetary and space sciences, were out of town presenting her findings at a scholarly conference. The papers will be published on eScholarship, which is the UC-system’s open-access platform for scholarly research. Additionally, the efforts of a team of undergraduates who studied historic incarceration rates of African-Americans in Los Angeles appear on a dedicated website. Watch a video of the proceedings. The winners of the UCLA 2015 Library Prizes for Undergraduate Research.